Four members of an unnamed North Georgia militia planned to attack cities including Atlanta with deadly ricin, bomb federal buildings and murder law enforcement officials and others, according to charges leveled yesterday. Another member of the group, Samuel J. Crump, 68, allegedly said at a September meeting that he wanted to make 10 pounds of deadly ricin powder and disperse in a series of cities. He said that it could be blown out the windows of a car traveling down an interstate without harming the plotters. An affidavit said that Crump just last week said he was going to begin shelling castor beans, from which ricin is manufactured. Another alleged plotter, Ray H. Adams, 65, allegedly said he had a formula for making ricin and knew ways to get the needed ingredients. "I'd say the first ones that need to die is the ones in the government buildings," Adams allegedly said during an April 2011 meeting. The other man arrested yesterday was Dan Roberts, 67. Although the affidavit did not name any group the four men were affiliated with, the Southern Poverty Law Center has found records identifying a "Capt. Dan Roberts" as the contact for the 440th Squad of a militia group called the North Georgia Area Command. That command is part of the Georgia Militia, a group that has 19 chapters in that state. At one meeting, Thomas allegedly discussed creating a “bucket list” of officials, politicians, business leaders and journalists who he thought should be “taken out” to “make the country right again.” He said, “I’ve been to war, and I’ve taken life before, and I can do it again,” according to the affidavit. During a four-month period that ended when they were arrested on Monday, Thomas and Roberts negotiated with an undercover FBI agent to buy a silencer for a rifle, as well as a conversion kit to make the rifle fully automatic. According to the FBI, Thomas planned to use the silencer he was purchasing and said he would clean the rifle and use rubber gloves to conceal his fingerprints. As the negotiations dragged on, Thomas and Roberts expressed concerns that the undercover agent was a law enforcement officer, “but wanted to go forward with the transaction anyway,” according to an FBI statement. Besides discussing ways to manufacture and distribute ricin, Crump also allegedly suggested that the group pursue financial backing to go to Africa to acquire the material needed to make botulin, a potent neurotoxin that can lead to paralysis. "We'd bring it back over here," Crump said, according to an affidavit. "It's more potent than the stuff [ricin]." The authorities allege that Thomas planned to use an online novel, Absolved, as a model for the actions of his group, which he referred as the “covert group.” The novel, which describes a small group of Americans who attack federal officials, was written by Alabama resident Mike Vanderboegh, a long-time militia leader and, more recently, a founder of the Three Percenters, an antigovernment group. In the 1990s, Vanderboegh was associated with a series of antigovernment “Patriot” groups including the Alabama Constitutional Militia, the Tri-States Militia and the 1st Cavalry Regiment, Constitutional Militia. Earlier this year, he was also a Fox News analyst who specialized in criticizing the ATF for a botched investigation of Mexican gun-running. Vanderboegh was the subject of a short blast of negative media attention in March 2010, when he called on opponents of health care reform to illegally attack Democratic Party office windows with bricks. “Break them NOW,” he wrote. “Break them and run to break again. Break them under cover of night. Break them in broad daylight.” In the following hours, windows were smashed in New York and Kansas in response to Vanderboegh’s call. In the last few hours, Vanderboegh posted a whiney note, complaining of being "dragged into" the case. He also gives a brief description of the book. "My as-yet-unpublished novel Absolved, for the uninitiated, begins with the premise that the ATF, for political reasons of their own, has staged a deadly raid on the wrong Alabama good old boy from Winston County and what happens in the unintended consequences of that stupidity." In the book, Vanderboegh compares his fictional scenario with deadly standoffs in Ruby Ridge, Idaho, in 1992, and Waco, Texas, in 1993. The court affidavit says that the confidential informant accompanied Thomas and Roberts to “a meeting held in south Georgia on 04/30/2011.” The affidavit says nothing further about the meeting, but the Southern Poverty Law Center has records showing that a group called the Southeast Constitutional Militias held what was billed as a “Multi-State Meeting” that day at a location on private property “near Valdosta,” Ga. “We will be meeting to discuss collaborative and cohesive efforts throughout the Southeast to form a better united and communicative militia,” the group said, adding that militia men from Georgia, Florida, South Carolina, Tennessee and Alabama were expected. The alleged North Georgia plot comes in the context of a Patriot movement that has been growing explosively since 2008, propelled chiefly by the election of a black president who represents the changing racial demographics of the country, and by the economy, which has caused many to look for scapegoats. 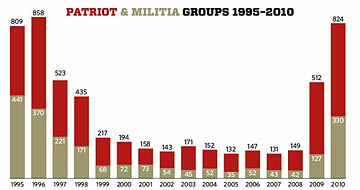 According to the SPLC, the number of Patriot groups went from 149 in 2008 to 512 in 2009 to 824 in 2010; the count for this year is not yet complete. The plot is also the latest of approximately 100 domestic terrorist plots from the radical right since April 19, 1995, when Timothy McVeigh, another militia enthusiast, murdered 168 people in an Oklahoma federal building.